OO gauge or OO scale (also spelled 00 gauge and 00 scale) model railways are the most popular standard-gauge model railway tracks in the U.K. This track gauge is one of several 4mm-scale standards (4 mm:foot / 304.8 mm or 1:76.2) used, but it is the only one to be served by the major manufacturers. Despite this, the OO track gauge of 16.5 mm (0.650 in) is inaccurate for 4mm scale, and other gauges of the same scale have arisen to better serve the desires of some modellers for greater scale accuracy. N scale is a popular model railway scale/track gauge. Depending upon the manufacturer (or country), the scale ranges from 1:148 to 1:160. In all cases, the gauge (the distance between the rails) is 9 mm (0.354 in). The term N gauge refers to the track dimensions, but in the UK in particular N gauge refers to a 1:148 scale with 9 mm (0.354 in) track gauge modelling. 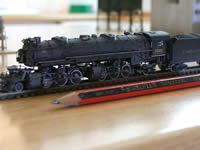 The terms N scale and N gauge are often used interchangeably. An advantage of N scale is that it allows hobbyists to build layouts that take up less space than HO scale, or put longer track runs into the same amount of space, because the models are smaller (by nearly a half) than they are in HO scale (1:87).